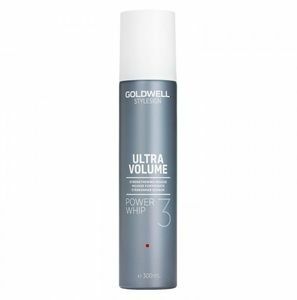 Infuse your limp, fine hair with body with Goldwell StyleSign Powerwhip Strengthening Volume Mousse. Its amplifying formula gives you thicker feeling hair and long lasting hold for big, beautiful locks. Formulated for use on fine hair, Goldwell StyleSign Powerwhip Strengthening Volume Mousse will give your locks extra body and elasticity. Working from the root to hold your style in place this strengthening mousse leaves you looking and feeling confident. Gives strong hold and long-lasting volume. With heat and colour protection. Directions of use: Apply to towel dried hair.